Having a smoker is awesome because you don’t have to worry about what to serve your guests during the next backyard barbecue party as it will do all the grilling for you. An electric smoker is so easy and efficient to use, that your role in producing grilled meat and goodies is putting the food inside the grill, turning it on, and wait. This is a new take to the good old grill, as smokers won’t require your full attention anymore. If this is your first time getting a grill, the Masterbuilt Electric Smoker, is one of the favorites in the market that you should also consider buying. PROS: This smoker is one of the best you can get for your bucks. At a price that’s very affordable you’ll be taking your grilling to new heights. Whether you’re new or a seasoned smoker, the Masterbuilt will ensure you’ll have fewer hands on, intensive labor smoking. Instead, you can use this time to spend some quality time with your family! CONS: Many owners have complained about this products heater element that burns out quickly and can’t be replaced. When the heater element is gone, the electric smoker is considered junk because you can pretty much do nothing with it. Owners have contacted customer support and had varying answers: Either buy their newest product for less the price or refund their money. What are the important aspects of the Masterbuilt Electric Smoker? Type: This product is an electric smoker that can be plugged directly to your home outlet. It’s safe to use although some owners complained about their wires “burning” but this is a very rare case; out of the over a thousand reviews on Amazon, only a small few reported this. Electric smokers may be cost-efficient than gas smokers if electricity in your area is cheaper than gas. It varies per location. If you’re going for a cost-effective smoker where you will save a lot of bucks in the long run, do check what’s the cheapest fuel in your location prior to purchasing. Of course, if you’re really up to saving, there’s the all time cheap fuel, which is wood and charcoal. You can opt for that. Another thing about electric smokers that barbecue fanatics don’t like about is the lack of smokey flavor of the meat. Only charcoal smokers can effectively add this flavor while gas smokers can add some. Portability: It weighs about 50 pounds and can be really heavy if you want to move it around, especially if you want to store it in your garage and take it out to the patio only when it’s time to use it. One of the good things about this product according to reviewers is the built-in wheel. It’s kind of tricky to use so they gave a tip: Wheels work best when the unit is tilted. Capacity: This electric smoker comes in two sizes, 30-inch and 40-inch. What we’re reviewing is the smaller one, which comes with four racks, capable of being loaded with big roasts and whole chicken or turkeys at a time. You’ll be able to put in a total of 30 pounds of meat in one cook. Getting the 30-inch one is more than enough if you’re only serving your family and some guests, about 15 guests in total. If you’re expecting more than that, get the bigger model. Insulation: The Masterbuilt Electric Smoker is well insulated. It comes in a cabinet style body that is really chunky, that you don’t have to worry if the heat from the inside is leaking out. Customers say that this style is better than the traditional side smoker, bullet, etc., Owners said that they have double checked the temperature inside with their own digital thermometer to check its accuracy and reported that the smoker’s temperature run true within a degree or two. Accessories: You never have to open the door to check the temperature because it comes with a built-in thermometer that lets you set your preferred temperature. If you have been smoking a lot, you’ll know that keeping the temperature steady is what you’ll likely do a lot, if you want to achieve your ideal grill. You can constantly check the temperature in the built-in digital face to ensure that it’s up to par. 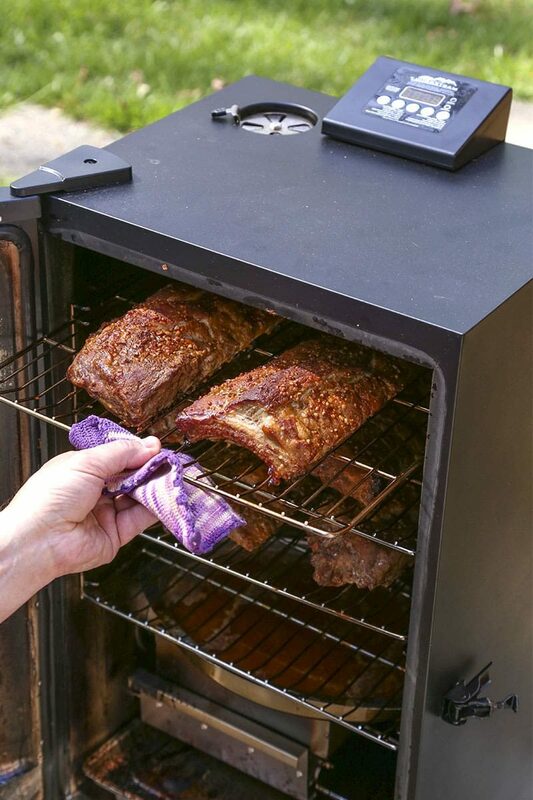 This smoker also comes with a handheld remote control (two AAA batteries required), which lets you program the time and temperature as well as check the meat probe temperature and switch the light on and off. What other things should you know about the Masterbuilt Electric Smoker? Assembling the smoker was very simple and took only about 15 minutes. 24-hour timer with an automatic shutoff, so food is never overcooked or dry. It comes with only 90 days of limited warranty. With all its good reviews about great smoking and grilling with little to no supervision, there are also negative reviews about the heating element, which is the one that’s most likely to fail. Masterbuilt’s customer representative said that the heating element can be replaced on all of their smokers but some will require new body assembly as well and that they don’t really stock parts for older models. It’s imperative to check if the Masterbuilt Electric Smoker that you’ll buy is in their list of “new models” so you’re sure that if your run into problems, the company will be able to send you the right replacements. Those that own older models were offered to buy improved unit with a discount while some were given full discounts. The response of the customer representatives varies, but overall they’re easy to talk to and are helpful. 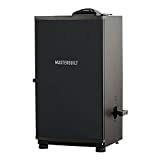 As stated before, make sure to get the newest version of the Masterbuilt Electric Smoker because the company doesn’t stock old parts. If you run into problems, you’re sure that there are replacement parts waiting for you. Generally, Masterbuilt doesn’t charge for these parts, especially if it’s still under their warranty. And if you’re unhappy with the product overall, they will send you a full refund. Only very few had complaints though; the majority of users loved their Masterbuilt Electric Smoker so it’s definitely worth a try.